In its relatively short but influential history, Google&apos;s Chrome browser has established itself as far-and-away the most aggressive of the pack when it comes to rethinking the way we view the Web. Whether it&apos;s, pioneering "Private Browsing," finding a way for tabs run independently from one another or pushing HTML 5 bright and early, the browser has inherited its parent&apos;s most cavalier and progressive sensibilities. Google hasn&apos;t always been known for avant-garde design thinking, (think of Blogger and early Android builds), but Chrome&apos;s ruthlessly minimalist and clean design has been its trademark. Now, after axing toolbars, the bookmarks bar and even the Home button from its default setting, the Chrome team is experimenting with a new version of the browser that doesn&apos;t even have an address bar. That would bring the number of screen lines occupied by the browser down to 1. Instead of a traditional address bar (already a non-traditional, search-integrated "Omnibox" in Chrome), Google is experimenting with a new system that displays a url box only when the user hovers over a tab. 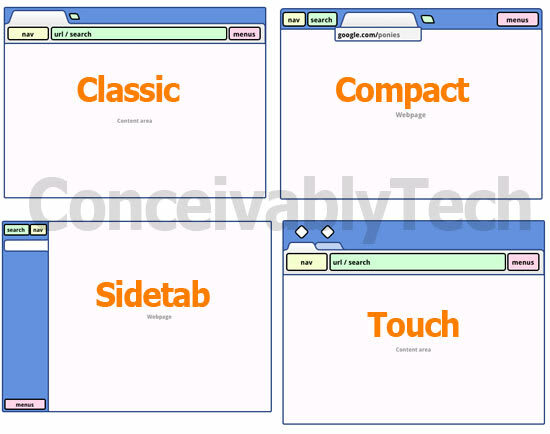 This "Compact" version of Chrome is one of four future options currently being considered by the Chrome team, among which are touch-based and "classic" versions. The "less browser, more Web" ethos is particularly suited for a future dominated by HTML 5 Web apps like those promoted by Yahoo&apos;s LiveStand and Google&apos;s own Web Store. But the old design adage says "take away until it breaks;" and Chrome&apos;s steady evaporation always runs the risk of breaking the browser experience for some users.